I recently undertook the Q Grader Course and passed the notoriously difficult exam in the first try. Get all my best study tips in this article. From the way people talk about Q Graders it seems that they almost live in a parallel coffee universe; somehow elevated from the minutiae of grinding, tamping and brewing. Just the name itself carries a certain 007-esque allure. The reality of what being a Q Grader entails is a bit more down-to-earth; more about that later. Why become a Q Grader? For a while, I have wanted to get some formal coffee credentials to my name. Sure, running a coffee blog and brewing & roasting some delicious beans at home is more serious than the average consumer, but then again, in this day and age, many people claim they are experts on the internet. I am one of those outsiders who has never worked in a café or roastery. Most of what I know about coffee I have picked up by myself or in an informal setting. I must say, there have been a ton of these ‘informal learning situations,’ but without a diploma or actual work experience on your CV, it can be hard to convey to both readers or peers. A few years back when I was working on an article about the booming coffee industry in China, I came in contact with a Q instructor. Samuel Gurel is the founder and CEO of Torch Coffee; an international coffee company based in Pu’er in the Chinese province Yunnan. 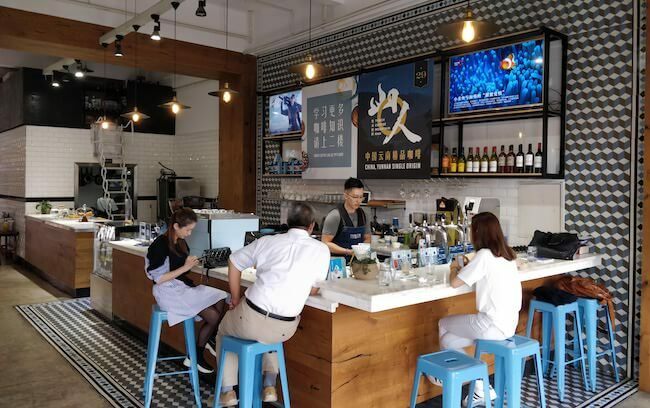 Not many people know it, but this region of China produces specialty coffee. Samuel has held many roles in the coffee industry besides teaching Q and R (Robusta) Grader courses. 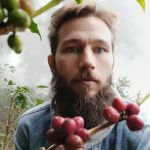 He has managed a coffee farm in Guatemala, opened a number of coffee shops, and even developed a coffee bean color sorter, so when I saw that he was going to host a Q course in Chiang Mai, Thailand – my hometown for the last couple of years – I enrolled right away. Due to unfortunate events, however, the course was canceled. 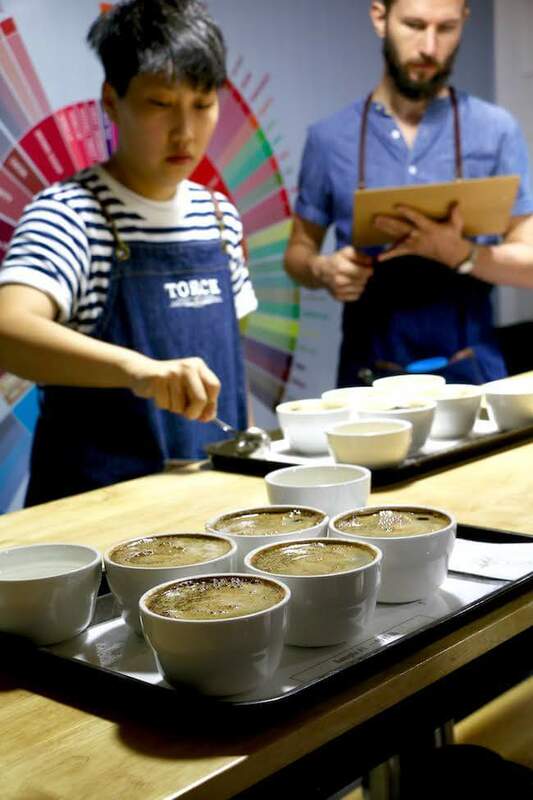 I was suddenly faced with a decision; should I go up to Torch’s Coffee Lab in the Yunnan province to attend the next available course? I have been to China before, so I knew that it’s a more complicated country to travel in than average. The Great Firewall sounds fun and charming, but it does make life complicated when you can’t access much of the Western cyberinfrastructure. I decided that a day of applying for a visa and setting up a hacker-level VPN would be worth the effort and booked my tickets to China. 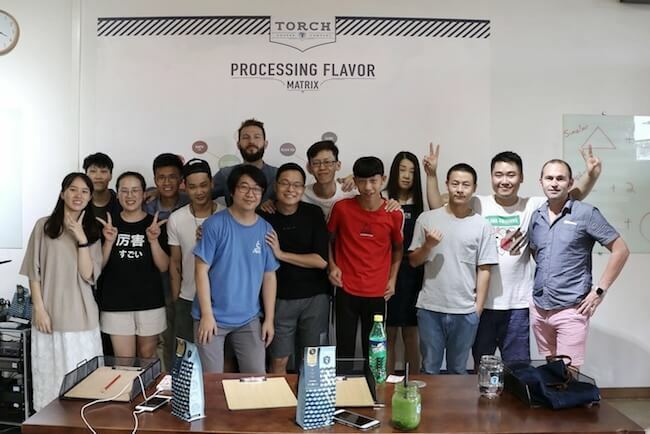 Torch Coffee Lab in Pu’er, which is the company’s headquarter in China, has evolved a lot since I was there in 2016 working on my story about Chinese coffee for Sprudge. Most notably they have opened a large and stylish café. It’s the kind of place, where every little detail seems to be well thought out. A spiral staircase leads up to the first floor, which is entirely dedicated to the classroom, cupping lab, and sample roasting. At my designated desk an apron made of denim, two cupping spoons, a spitting cup, and a clipboard was prepared for me when I arrived. 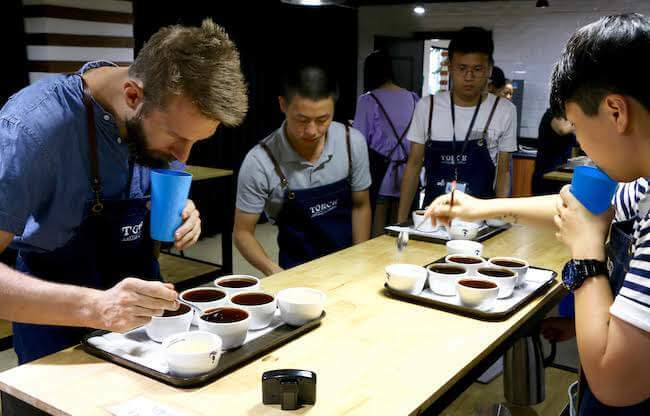 Taking the course in the coffee growing region in China might seem a bit unusual. But this is actually how the Q programme was initially envisioned. 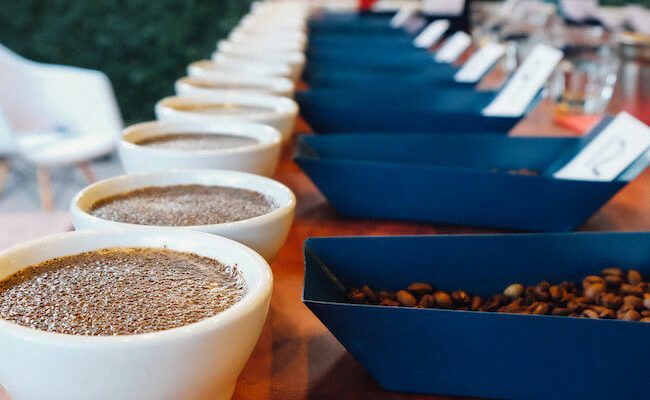 Around 20 years ago, it became apparent that the specialty coffee industry needed a global standardized way to evaluate and accurately describe quality coffee. However, the need was more urgent in the coffee producing countries rather than the consuming ones. For that reason, it was the Coffee Quality Institute, back then a newly formed NGO established by SCAA to improve knowledge among coffee farmers, who undertook the responsibility of developing a curriculum. When the course launched in 2003, the target audience was coffee producers in third world countries. However, in recent years, the Q Grader title has gradually become the standard everywhere in the coffee industry. Today, it’s not uncommon that ambitious baristas get certified, even though one could argue the content of the course doesn’t have much to do with everyday coffee brewing. Nonetheless, most of my classmates were baristas. Since only a few of my classmates understood English, the course was held in both Chinese and English. Either the instructors would speak in Chinese, and I would have a personal translator or the other way around. The course is composed of three days of teaching and exercises and three days of exams – roughly speaking. However, already on the first day, we had the green bean grading test, which is arguably one of the easiest in the course. 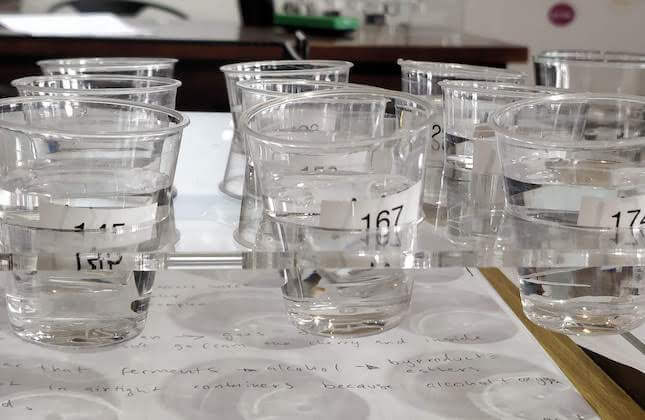 To pass you have to go through three sets of 350 grams samples of green beans and correctly identify primary and secondary defects in at least two of the examples. This task is relatively simple compared to the sensory tests, but I almost failed because I didn’t fill out the sheet correctly. Being a Q Grader isn’t only about using your taste buds, you also have to be able to fill out forms. And there are a lot of them. Notably, the SCAA cupping score sheet can take a bit of time getting used to. There are 20 exams to pass if you want to obtain the license. The many tests also mean that there is no time for fluff. Classes started at 9 am every morning and continued until 5 or 6 in the evening, only interrupted by a one-hour lunch break. There’s a lot to absorb every single day. I have seen other Q Graders suggest taking a quiet week outside the course, and I can only recommend the same. Don’t plan any work, social activities or intensive sport during the week. You’ll be utterly exhausted after a day of cupping and in need of proper rest. Why is it so? I think that using the sensory faculties extensively for a whole work day is unusual for most people; even experienced coffee professionals. It’s like training a new muscle group in the gym. You need that extra recovery time. For me, that meant taking it very easy most evenings. A little walk or jog, some bland food, and watching a documentary at the hotel before bedtime. That was pretty much the schedule. I did go out to eat Chinese hotpot with my classmates one night, and I felt like my taste buds were impacted the next day. However, you’re not reading this to hear about my ascetic lifestyle – instead, you want the actionable and efficient hacks for passing the exams. Am I right? Well, this isn’t an easy task, and in fact, we were only two students in the class who were able to ace all tests in the first try. A low pass rate isn’t uncommon all. From what I have heard it’s generally around 20 percent. Some of the tests are excruciatingly difficult, and there are so many that you might mess up, just by being inattentive. That almost happened to me a few times. Evaluating coffee objectively is the fundamental job of a Q Grader. Cupping is the place where all the small skills that make up the toolkit come together. In other words, if you want to pass the exam, you need to be able to cup. Because cupping is so important in this framework, you should get familiar with the SCA Cupping Form beforehand. 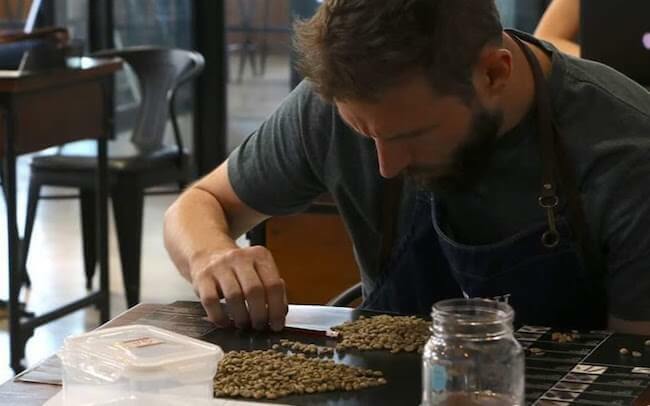 Even though your instructor will explain everything about it during the course, I found that it helped me to remain calm and focused that I had already been cupping with friends and other coffee professionals quite regularly for a couple of years. 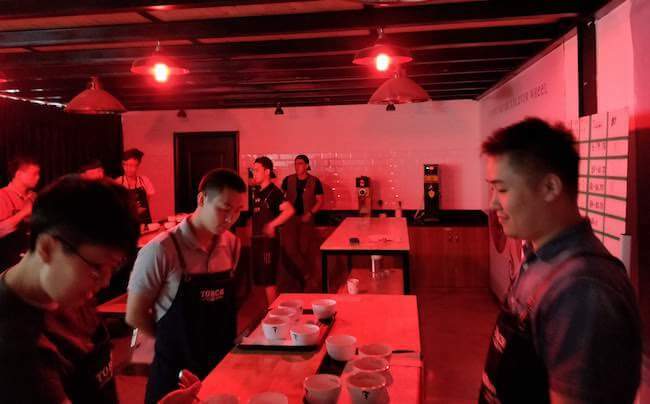 The four cupping flights are the core of the course, and along with the general knowledge test, these are the only tests, which can’t be retaken during the sixth day of the course, so it’s worth preparing. Cupping is one of the Q Grader’s main jobs. I have mixed feelings about the SCA Cupping Form, but it’s the standard in the industry right now, so thinking that it’s silly won’t help you. A quick example of why it is not optimal: The grade 7 is supposed to describe an aspect of flavor as ‘very good.’ Yet, if you give out 7’s in each and every parameter, the coffee will score a total of 79 points, which is not considered specialty coffee. Pro-tip: At the cupping table, you will have to evaluate six coffees, and you’ll have five samples of each. That is a total of 30 different cupping bowls. Keeping track of all that coffee is a pretty demanding task, so if you remember the following bit of math, it will make it easier for you to remain composed and focus on flavor. Most coffees are awarded 3×10 points for sweetness, uniformity, and clean cup. That leaves you with seven categories to evaluate on a scale that goes from 6 to 10. Say, you have a coffee that scores 7 in all areas, but 8 in ‘body’ and ‘acidity,’ you instantly know that it’s a total of 81 using the heuristics above. The triangulation test aims to see if you can discern between three cups with one different from the rest. This test is another one that many students fail. In my experience, some of the matchups are very obvious, while others are incredibly difficult to detect. My technique for these tests was to trust my nose. I would aim to sniff every triad 2-3 times, each time, making a little mark next to the cup that seemed different. Then I would try NOT to pay any attention to the wet aroma. In my opinion, this often leads to confusion. After breaking the crust, I would again wait 5-10 minutes to make any evaluations based on flavor. As the cup cools down, it becomes way easier to detect differences. A couple of whiffs and a lukewarm slurp are all you need. Don’t over-cup and start second-guessing yourself. The last tip that helped immensely came from our instructor Samuel Gurel. He suggested that instead of focusing on which cup is different we should attempt to describe flavor notes as we do while cupping regularly. Doing it this way, allows you to tap into all the mental and sensory resources you have. Many students fear the sensory test where you have to separate salt, sweet and sour. For that reason, it’s a good idea to familiarize yourself with the kit beforehand, and pay particular attention to the smells that you don’t recognize. Your school will probably leave the set out during the course so that you can practice during the lunch break. By memorizing these four groups, you’re doing yourself a huge favor. It’s a lot easier to use the process of elimination when dealing with 12 olfactory samples compared to 48. Also, understanding these four groups of aromas and how they relate to coffee growing, roasting and storage is a huge epiphany. Cupping bowls in the front, and the flavor wheel in the background. I thought that this test would be a piece of cake, but it’s pretty tricky. You have one hour to answer 100 questions, and you need to have 75% correct. A minority of the questions is about the fundamental stuff, but there will be a bunch of weird questions about the physiology of your tongue and taste receptors, as well as SCA standards for roasting and cupping. Make sure, to memorize details like what kind of grind and bowl size you should use for cupping. In general, the questions focus on the thing that you go through during the course, so if you pay attention and take notes, you should be able to pass this one. However, if you’re not good at remembering trivia, then I’d do some extra studying during the week, trying to memorize the cupping and roasting protocols. Failing this class isn’t cool since you can’t retake it immediately. The week that the course lasted reminded me of being back in university – just a lot more intense. Taking the course, and passing in the first attempt, has boosted my confidence. Being a coffee writer and home roaster, I have been in a somewhat isolated position, compared to most of my colleagues in the industry. However, now I know that I have the sensory skills and vocabulary to describe a bean accurately. I think many coffee professionals can recognize this feeling of not being sure about your skill level. If you work in a small coffee shop and only have a few colleagues, you’ll most likely quickly settle on some definition of what constitutes good and bad. Doing the Q means that you risk becoming aware of your blind spots. However, this is the only way you can improve. It’s one thing to brew a Kenyan down in your cool shop and lecturing customers about raspberry notes, but another thing entirely to cup it blind, and being able to pinpoint those same notes. After six days of cupping, slurping and smelling, the majority of us are Q Graders. The course combines every aspect of tasting and sensing and relates these attributes to green beans and roast. It’s structured methodically, and there’s no ‘filler’ content in the curriculum. I wouldn’t recommend every single barista out there to obtain a Q license, that would be silly, but if you view coffee as more than just a beverage and you can see yourself working in areas such as roasting, quality control, and green beans, then it will accelerate your learning curve with years. Next available Q Course – book here.